Nataliah Bruno, 10, holds a bunch of balloons after helping to paint a rainbow crosswalk to honour Two Spirit people in Maskwacis, Alberta on Wednesday, June 13, 2018. Two Spirit refers to people who hold both feminine and masculine energies and is a concept that precedes European settlers in Canada but after colonization, many gender non-conforming people have suffered ostracism and violence in indigenous communities. After consulting other Two Spirit groups across the country, organizers believe that the crosswalk is the first of it's kind on a reservation in Canada. Zoe Whittall is the author of Giller-shortlisted novel The Best Kind of People. When Toronto Mayor John Tory tweeted a Pride message that began with “Pride is for everyone looking for full inclusion,” I felt like it represented the worst of what Pride has become – a vague party that waters down queerness with sentimental messages about how “love is love.” But Pride celebrations are not for “everyone.” There’s a reason they are still necessary in 2018, but it’s hard to see in Toronto. The last time I attended the city’s parade I got hit in the head by a sample pack of razors thrown from the back of a flatbed truck. No thanks, Gillette, I don’t want your participation in the revolution. I’m not going to Pride this year, after 23 years of attendance, and not because it’s too political, as some say. When Black Lives Matter stopped the parade in 2016, it was precisely in the spirit of Stonewall, the riots in New York City that begat the entire Pride ritual, and that was thrilling. But watching the vitriolic and racist reaction to that action exemplified how, as a city, we’ve lost sight of what the Pride parade means. You can still see a glimpse of meaning if you attend marches in smaller cities, or the dyke and trans marches, both offering a celebration of visibility in the face of small numbers and real barriers. Most queer and trans people still have to leave their hometowns and move to a city in order to survive. Trans women in Toronto have to worry for their safety every time they leave the house. Holding a rainbow fan with a facile message from a corporation isn’t going to stop that. 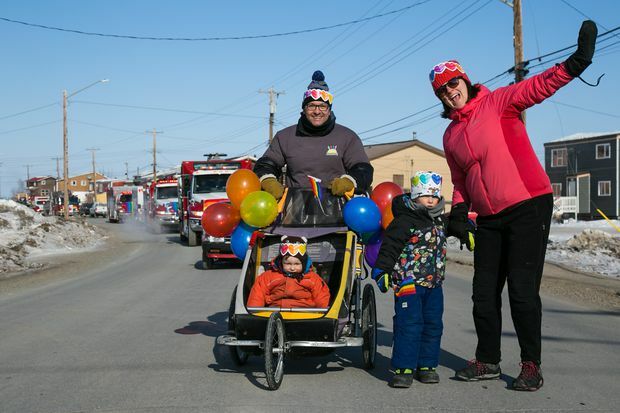 April 21, 2018 - Inuvik - Jasmine Keogak, high school student and one of the Inuvik Pride Parade organizers: "I've always been open to different people and ideas, and learning how people can be homophobic made me sad. I wanted to do something about it". After all, this was a particularly terrible year for the relationship between the LGBTQ community and the police. Two officers were charged with misconduct for failing to look for the body of Tess Richey, who went missing after leaving a gay bar. Her body was found by her own mother, who’d driven in from out of town. And then there’s the alleged serial killer who preyed for years on Toronto’s Gay Village – many in the LGBTQ community have questioned whether police did enough to find the missing gay men. It’s not a year for platitudes, it’s the year for apologies, action and promises to do better. I attended my first Pride march in 1995, at 19. It was small. Straight people did not stand on the sidelines cheering – they averted their eyes, cradled children, or yelled hostile things at us. We stuck together. Even though there was music and dancing, it felt like a protest. Later, when we were leaving a lesbian bar – its entrance was an unmarked grey door in a parking garage – we ran from a group of threatening frat boys and into a cab to get home. I was upset and shaking, while my friends were blasé, used to fighting back if they had to. To be in a Pride parade at that time, to be proud despite the nastiness we had to deal with, felt meaningful. But it isn’t just a fact that things have “gotten better.” Generations of queer and trans people have fought for every human rights gain – including the right to hold a rainbow water gun in a pair of booty shorts. But it isn’t over. There are still very political, very urgent reasons to celebrate Pride. It’s hard to see that in Toronto, surrounded by the blur of corporate messaging and with politicians and police wanting to claim our cause for some good PR points. If you’re not homophobic, great. But the parade isn’t a celebration of basic human decency, it’s to dance in the streets to celebrate we got through the year, to honour the work LGBTQ activists did to get us to where we are, and to say we’re not going anywhere, no matter what you do or say.